BURNLEY, England (CNS) — A diocese in England is using a double-decker bus as a venue for priests to hear the confessions of people who have stopped going to church. 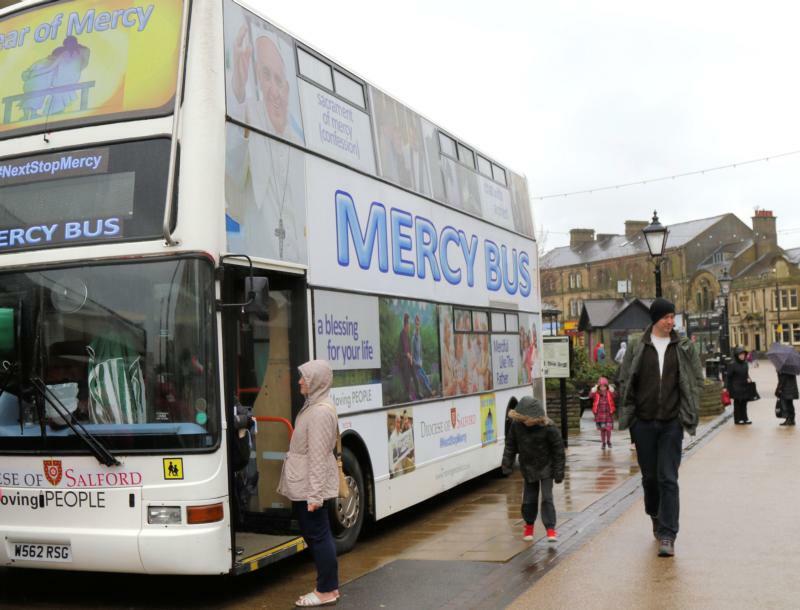 The Mercy Bus is touring the Diocese of Salford during Lent in an attempt to reach out to lapsed Catholics. Each Saturday, the bus parks in a busy area of Manchester or one of the outlying towns, and volunteers try to engage shoppers by offering miraculous medals blessed by Pope Francis as gifts. If they receive a positive response, they are invited on the bus, where they can talk with a priest or receive a blessing — and also go to confession. Two priests offering the sacrament of reconciliation are stationed at the front and rear of the upper deck and one at the rear of the lower deck. Visitors can also depart with information about the Catholic faith and about times of Masses in their local area. In the first two weeks, when the bus visited Salford, then Bolton, more than 400 people visited, he told CNS in a Feb. 20 interview in Burnley, on the morning of the bus’ third stop. Priests later reported hearing the confessions of “significant numbers” of lapsed Catholics, some of whom had not been to church “for decades,” he said. “We are meeting people where they are, we are parking up beside their lives,” said Father Mulgrew, 38, a former stand-up comedian who turned his back on a career in children’s television to become a priest after he said he personally experienced the mercy of God in confession. “We are saying: ‘If you have got any burdens, come on the bus and be free from them. If you are going through any struggles right now — a family feud, financial problems, a broken relationship — come on board the bus and experience God’s mercy,'” he said. “We are trying to reconnect people to faith and provide a place of welcome for them, and acceptance, and a place where they are going to encounter God’s mercy in a tangible way in their lives,” Father Mulgrew said. Father Mulgrew said the initiative was inspired by the public ministry of Jesus “on the hilltops, in marketplaces and at the dinner tables” and also by the open-air Masses celebrated in the slums of Buenos Aires, Argentina, by Cardinal Jorge Bergoglio before he became Pope Francis. The initiative was conceived by a Salford diocesan Year of Mercy “outreach group” of which Father Mulgrew, a curate in Blackburn, is a member. The bus was hired from an Accrington-based company called Moving People at the cost of $330 a day. Initially, the plan was to use the bus on each Saturday in Lent, but the initiative is proving to be such a success that diocesan officials said they plan to retain the vehicle until the end of the holy year in November. The sides of bus show images of Pope Francis and priests hearing confessions on either side of “Mercy Bus” in huge letters. Pope Francis has given his personal blessing to the initiative and, according to Father Mulgrew, “laughed spontaneously” when he presented the pontiff with pictures of the Mercy Bus. “He gave me this great beaming smile which I took as a great encouragement and affirmation of what I was working toward,” Father Mulgrew said. “We are going out to them, rather than expecting them to come to us,” the bishop said. The bus is accompanied by up to 40 volunteers and a band of musicians who play live music to draw the attention of the passing crowds. Among the volunteers is Hannah Beckford who, from 11 a.m. to 4 p.m. each Saturday, approaches shoppers with the offer of a miraculous medal. “We say ‘Would you like a free gift from the Holy Father?’ and they often come back and ask a bit more about it,” said Beckford, 25, who also serves as a chaplain in St. Joseph’s Catholic High School, Horwich. “It has caused a lot of interest, especially from people who haven’t been to church for a long time,” she said. “The amazing thing about it is that it has thrown open the doors of the church,” she said. “People are coming off the bus smiling and expressing sincere thanks. What a great idea. Kudos to the Diocese of Salford.